The new 4610 SureMark Printer Model 1NR is a single-station thermal POS receipt printer offering high-speed receipt printing - up to 80 lines per second, superior reliability, serviceability, and usability. Available worldwide, this model replaces models Tx6, and Tx7 and can easily be configured by users to print DBCS (double-byte character set) characters used in some Asia-Pacific countries, or SBCS (single-byte character set) characters, used in most other countries throughout the world. Available RS-232, RS-485 and USB (2.0) communication interfaces enable attachment to IBM's wide range of SurePOS Series point-of-sale systems plus PCs and competitive systems. Servicing and managing this new POS printer is very simple and easy. Customers who choose to service their own printers will value the simple FRU (field replaceable unit) replacement of the thermal print head, the main card assembly, and the communication interface adapter. Systems management sensors include a paper motion / paper out sensor, cutter-complete sensor, a low-paper sensor, a print head -health- sensor plus several more. The 1NA model includes Advanced Exchange service and the 1ND model includes Depot Repair service. These two models are not available in all geographies. Extending IBM's commitment to Eco-Friendliness, this new 4610 Printer minimizes landfill waste and carbon emissions by using packaging materials that consist mostly of recycled post-consumer materials. All packaging materials and most of the materials used to manufacture the printer are recyclable. Additionally, this printer is designed to print the very latest in receipt media technology - new polymer receipt media, which offers a very green alternative to paper receipt media. Several ease-of-use features have been added to this new model. Easy drop-and-load paper loading and a cover open button make paper loading fast and easy. Support for large four-inch diameter paper rolls minimizes labor expenses by reducing roll changes. A -compatibility mode- is offered for customers who wish to retain existing applications while upgrading their printers. This new model is designed to reduce the number of models offered and to accommodate late reconfiguration in the manufacturing and delivery process. Both the covers and interface card are features of the printer. Printer covers are nonfunctional and allow easy removal and replacement to accommodate color change. Submit an RPQ to purchase replacement cover sets. The interface card is designed to be assembled during printer set-up at the customer's site. This reduces the number of models and allows easy connection of cables to the interface card before it is attached to the printer. Improved Paper Roll Support Larger paper rolls means less paper changes. The SureMark now supports larger 102mm/4" paper rolls. New Low Paper Sensor Others printers may have low paper sensors but ours leads the pack in reliability and flexibility with remotely programmable set points. Improved Paper Cutter The paper cutter has been improved to cut 50% more receipts than previous generation. It is quieter and has several anti-jam features. Improved Thermal Print Head The thermal print head is designed to print 150,000m of receipts. Reliability and availability have been increased with additional sensors to improve diagnostics and ensure limits are not exceeded. Improved Serviceability	The receipt station print head, logic card and interface adapter can be easily replaced. This simplifies depot and on-site service. New configurable SBCS & DBCS Instead of different models with DBCS support, the 1NR can be software configured for different geographies. More Memory Memory available to store logos, fonts, bitmaps and information has been increased 6x previous generation. More Statistics Statistics are important to increase availability via accurate predictive preventative maintenance. More statistics means more aspects of the printer health can be checked remotely! Simple Upgrades	The 4610-1NR uses the same power supply and cables as the 4610-TF6/TF7. It fits in current integration trays making upgrades simple. Firmware Updateable firmware enables easy maintenance either using memory key diagnostics, via OS or via UPOS drivers. Maintenance Cost Annual maintenance agreements have not gone up! This single station model and replaces the 4610-TF6 and 4610-TF7. Does not include interface adapter. To get maximum speed, the printer must run in Native Mode. Driver updates supporting Native Mode are available. We plan to add an off-line sample receipt demo that is independent of software later this month. Q:Where can I find out more about Polymer Film Media? Q: I am attempting to configure a 4610-1NR with a cash drawer in eConfig and the option does not pop up. How do I order a SureMark with cash drawer? A:You have to use 4611 to get the cash drawer and till and lock. The 1NR did not release the cash drawer family since they are available as system devices. Q:Do the 1NR printers support the loading of a user defined font/cp ? On the TI3/TG3s, I load Greek cps I have designed using the font edit utility. A:Yes, in compatibility mode, the fonts you have should function and look exactly as they would in a TF6/7. The print head has the same dot pitch 203 DPI so it should look the same. A: Yes, in compatibility mode the same TF6/7 utilities should work. Q: User defined fonts are available in both compatibility & native mode ? A: Yes, user defined fonts are available. With updated drivers operating in native mode, you'll have access to the full 3M of user memory (Vs 256K on TF6) for storing more fonts if needed. A: The thermal print head test has two parts, the first is a general measurement with all dots off to see if there are shorts between pins. The more shorts, the lower the reported number. A typical value for a new print head would be above 200. The relative dot resistance table is of each dot tested individually. Typically they would be around 190-210 when new. When a dot fails open, the value would be higher. The exact value varies depending on the failure mode. Q: Is a spill cover available for the 1NR? Q: What operating mode is set in the factory? Q: My printer switched into Native mode after using Diagnostics. A: This Diagnostic issue is being worked on. Please try the latest Diagnostics. In practice, the USB specification limits the length of a cable for full speed devices to 5 meters (a little under 16 feet 5 inches). The following ID drawings and table provides a summary of the dimensions and weight. The 4610-1NR will fit into current integration trays. Note that although the base of the printer is the same width and depth as the 4610-TI3/TI4 it's projected dimensions as illustrated by the blue arrows below is larger to accommodate the larger 4" paper roll. The 1NR is also taller than the TF6/7. Older configurations may work in compatibility mode. For untested/unsupported configurations, a thorough compatibility test is strongly recommended before purchasing in large numbers. No POSS for DOS support. If you are using an older release of OPOS/JavaPOS, these devices will operate in Compatibility Mode but were not tested so you should perform a complete certification test before roll out. More details on all the available options is in the User Guide. If you need compatibility mode, please set emulation mode using the menus below. If the printer is powered ON, power OFF the printer and power it ON again using the power button. Immediately close the lid and press the paper feed. When the amber LED goes off, the printer should print out Menu 1 below. - To select option 2 you would press the paper feed button twice, then press and hold it a third time for 1 second. To the left is a sample test receipt. Note the Microcode EC level is listed along with the printer Serial Number. Also listed is the Interface Adapter type and if it's RS232, the configuration is printed. If the printer is in native mode, nothing is printed related to the mode. If it's in Epson Emulation or Compatibility Mode, it will be indicated. The Zoomit firmware package is a beta release of firmware that will ultimately be in both the 4610-2CR/2NR and 4610-1NR. Normally, when the printer is turned on, the firmware will determine what kind of printer it is running in and act appropriately. In order to facilitate testing of the 1NR function, you can use the USB Memory Key diagnostics to change two bits in an NVRAM location to force the firmware to always operate in 1NR mode. This in effect turns a 4610-2CR or 4610-2NR into a Single Station Thermal. You can run the "1NR" in compatibility mode as a TF6 and you also have the option of placing it in Epson Emulation Mode. The Zoomit firmware can be loaded into a 2NR/2CR using the USB Memory Key diagnostics and POS system or laptop. You can participate in the 4610-1NR EIP by requesting the Zoomit firmware package from TechLine. TechLine is also the first place to go to request any help related to IBM Retail POS systems. We route your questions directly to the subject matter expert who can best answer them and can open support requests as required. In the TF6/7 printer, one sensor combined the function of cover open and paper out. In the 1NR there are many more sensors. Applications can now be enhanced to better guide the operator in how to resolve any printer issues. For instance they could now display prompts to close the cover on the printer, replace the receipt paper, or clear a paper jam Vs previously only being able to display a check printer prompt. Number of times the max temperature of either the motors or the printheads.have been reached. The Direct API is an extension of the current TF6/7 command set which is documented in the 4610 Users Guide. A document of the extensions is available on request via Techline. We strongly recommend using the UPOS API or the Native Windows Driver. The SureMark single-station printers in single-byte character set (SBCS) mode can emulate the ESC POS - command set used in Epson single-station printers. Emulation mode provides full support for most Epson commands. However, some commands are supported partially and a few commands are not supported at all. This section describes the commands that have each of the three levels of support and also lists the connectivity differences between an Epson single-station printer and the SureMark. Be aware that because we can't predict what commands are being used by third party UPOS, OPOS, JavaPOS, Windows or other drivers, this mode only supports direct application control where the program opens a COM port and sends commands and data directly to the printer without intermediary drivers. The commands listed below are supported in Epson emulation mode. However, there will be some differences in the printed output, because of different dot pitches in the print heads and the minimum distance that the paper feed motors can move the paper. These differences will appear when there are a number of printed lines, and the method of aligning the data is different. - Logos will appear smaller in emulation mode. The logo will still contain the same number of dots in the width and height. However, because the SureMark print head has a finer dot pitch, the logo will appear smaller. If text is aligned around the logo, the text on receipts that are printed in emulation mode might not line up the same as receipts that are printed on the Epson printer. - If one line is aligned using spaces and another line is aligned using the relative position commands, the data might appear misaligned. The commands, such as the relative position and margin commands, that use the minimum unit of motion values are based on a fraction of an inch, which eliminates the differences in the dot pitch. Tabs and spaces are subject to pitch differences. 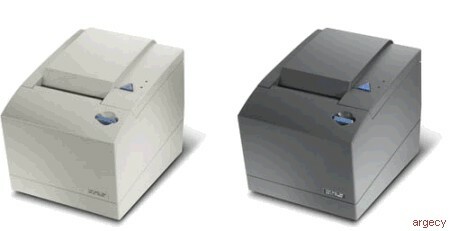 In Epson emulation mode, the SureMark printer supports all Epson commands except the page mode commands and smoothing. - The Epson printer offers a parallel interface that the SureMark printer does not support. - The Epson single-station printer requires a Null Modem cable. - The SureMark requires a standard 9-pin D-shell EIA-232 cable. - When applications switch from Epson printers to IBM printers, there is sometimes a difference in the receipt line spacing. The receipt appears double spaced because, by default, the SureMark printer treats carriage returns (CRs) the same as line feeds (LFs). To change this behavior see -Mode Option- MCT #30 (1E hex). - To provide a more seamless transition between OPOS-driven Epson and IBM printers, IBM now supports an OEM Printer Emulation setting in the OPOS printer device configuration dialog. Enable this setting to produce behavior that is more consistent with that of an Epson printer. Please use the USB Memory Key Diagnostics package to troubleshoot your printer. They also can update the logos, fonts, messages and firmware in addition to setting it's configuration.